We thought about calling this the “Have Your Cake And Eat It, Too” but that would look silly on the back. We agreed on calling it the HAMMOND Sk2 and when you play it you’ll see that first name is indeed appropriate. 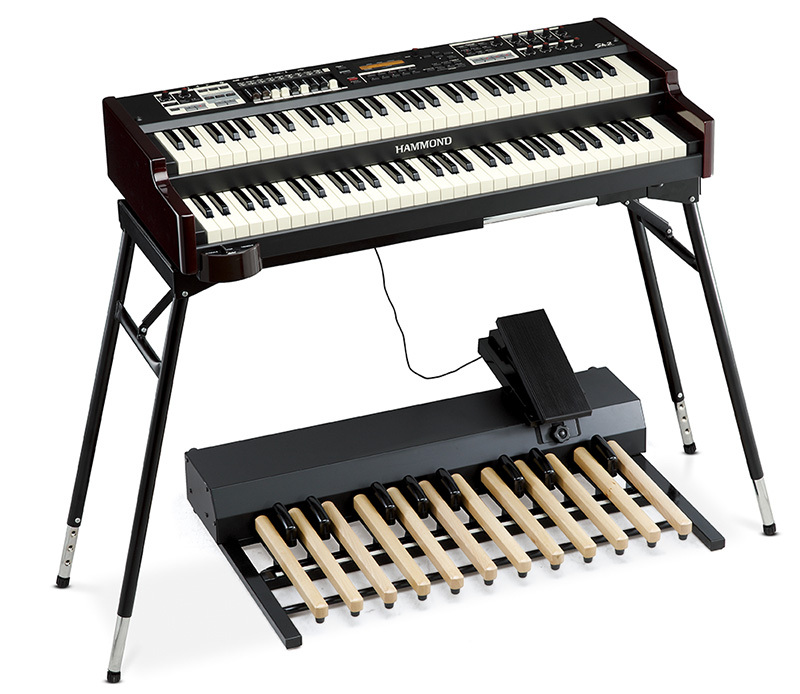 For many years, HAMMOND has been asked to make a truly portable double 61 note instrument that didn’t share the gross weight of a Refrigerator. The Sk2 can do it all. HAMMOND Drawbar voices up top, Grand Piano on the bottom-or vice versa. Manual Bass and Organ comp on the bottom, Horn section up top for accents. And yes, you can play the Sk2 as a double manual HAMMOND Organ in the traditional fashion, the Pipe Organ voices, too. Add one of our optional pedalboards, and you’ll have the pro rig you’ve always dreamed of, but didn’t have the roadies or van to realize. The Sk Series’ VASE III “Engine” uses the exact model of Laurens Hammond’s design, executing it in the digital realm, with no moving parts, retaining all of the nuances, imperfections and idiosyncrasies of the original. The wheels are always “spinning”. When a note is played, the tones pass, just as water through a faucet. The random starts of each wave played allow for phase interaction, producing the rich tone so prized in the vintage Hammonds. One of the most distinctive parts of the Hammond sound is the shimmering “Chorus Vibrato”. It adds a silken quality to the sound by adding a second, slightly detuned pitch to the original in the Chorus Mode, and repeat-modulating the pitch slightly in Vibrato mode. Few musicians realize the Chorus effect pedal widely used for Guitars and Electric Pianos had its genesis as a component of the Hammond Organ. Mr. Hammond’s original design used an electromechanical apparatus that looked much like the distributors you would find in the automobiles of the day, and ran off the same synchronous motor that powered the Tonewheel Generator. 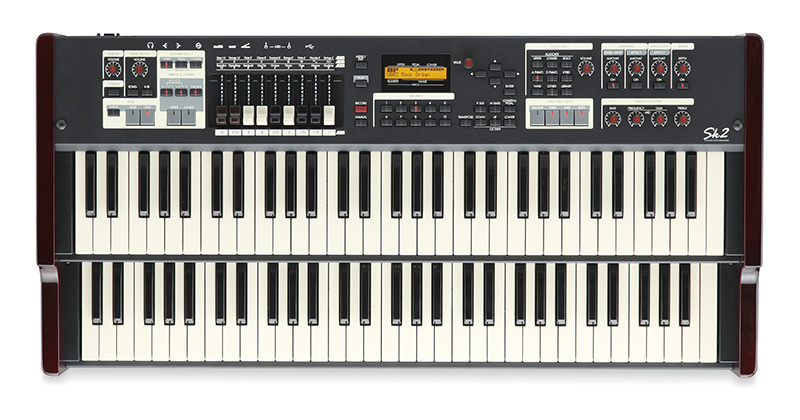 The Sk’s Chorus-Vibrato is executed in the Digital Realm, without moving parts, and works under the same model. The classic V1/V2/V3/C1/C2/C3 controls are familiar to anyone who has ever played a Hammond. As with the Tonewheel Generator, Digital control allows a wide range of adjustment that was simply not possible on the original. As the Antique organs aged, the components acquired their own unique qualities. Digital control allows the user to shape the Chorus/Vibrato’s various facets, with the added ability to “age” the effect-with the resulting treble emphasis and subtle distortion that marks the organs that develop this patina as “sweeter” than others. In order that every key (and pedal) of the Laurens Hammond’s Organ could access every Tonewheel as predicated by the Drawbar settings, an electro-mechanical apparatus lurked behind the keyboards, with 9 contacts corresponding to each drawbar for that keyboard and a series of contacts attached to each key. As a key was depressed, the contacts sequentially touched, and the circuits were completed to produce the Organ tone that was registered by the Drawbars. The very nature of Electric circuitry dictated a click could be heard at the top of each note played when the current-carrying key contacts touched. Laurens Hammond considered that click to be a nuisance, and worked to no avail in order to rid his organ of that imperfection. The jazz players who embraced the Hammond Organ, however, found the click to be a percussive highlight, and wanted nothing to do with its eradication. To make matters worse, as the Vintage Hammonds aged, the click became more pronounced, and by the Rock and Roll era, the Key Click assumed a role of importance that Laurens Hammond could never imagine. The Sk series allows you to adjust the intensity of the key ON click, and the key OFF click. The timbre of the click may also be adjusted. Mr. Hammond would have greatly approved of the Sk, as you can turn the click all the way off if you desire, creating a Vintage Hammond Organ that could not exist in the physical world. The inclusion of this obscure feature demonstrates the commitment to authenticity Hammond has brought to the Sk Series. Inside the Vintage Hammond B-3, on one side of the tube preamp, there was a “Screwdriver Pot” with the engraved legend “Tone”. This control was adjusted by the Technician installing the organ in order to tame the treble response in the instance of the organ’s installation in a Church or Mortuary, where a more muted organ was desired. The control was a cocktail of upper Mid and High frequencies (the proportions of which were, until recently, held secret. The “Tone” control was basically a “hi cut” control and only went “down”. You could not direct the control to go “up” for “boost”. The TONE control is included in the Sk’s menu with the added benefit of being able to BOOST the unique blend of frequencies, which adds a nice “edge” to the Sk tone, if desired.